One of the dinner themes I have been toying with for a while is “Eggs” and I finally got to try it out over the weekend. It ended up being a 13 course meal over 6 hours where everything included eggs, looked like eggs or looked like something that should have eggs in it. It was fairly successful with only a few minor hiccups along the way despite several of the dishes being first time attempts. The spectacular photos were all taken by Nithya using her DIY lightbox setup. The following is a description of the dishes with any tips and tricks I discovered along the way. 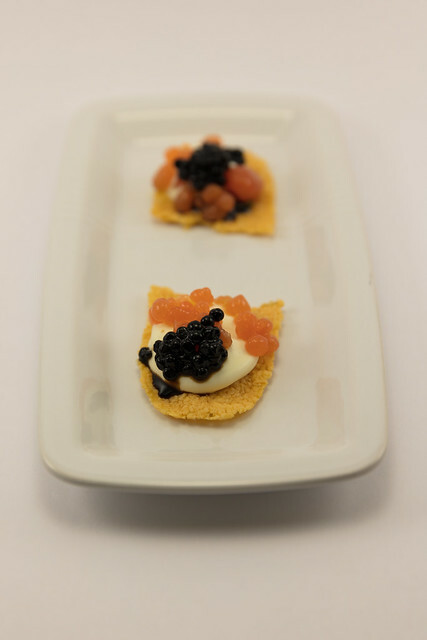 The first dish was served with champagne and was a play on caviar and salmon roe crackers since they are a type of egg after all. In reality it was a caprese cracker with the balsamic vinegar caviar and tomato juice roe on a dollop of creme fraiche and a basil leaf. The trick is not put too much creme fraiche on the cracker as it will overpower the acid from the caviar and tomato juice. 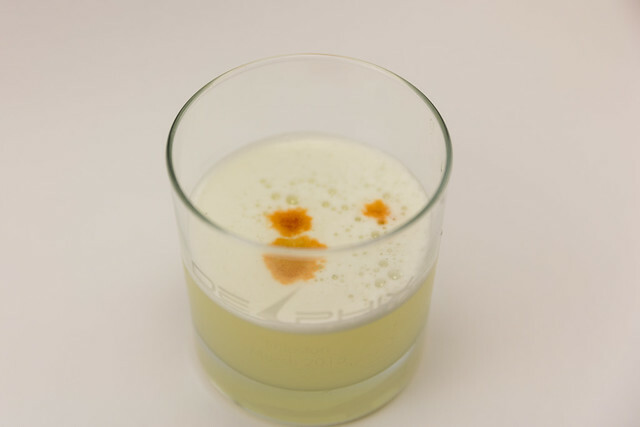 Since many of the dishes I prepared required only egg yolks, I had a lot of egg whites left over which made the classic Pisco Sour the obvious way to continue the egg theme as well as use some of the egg whites. Mine were made with a 2:1:0.8 ratio of pisco, lime juice and simple syrup shaken with ice and an egg white in a cocktail shaker to chill the drink and create the famous foam. It was them topped with 3 drops of angostura bitters for the herbal fragrance. The Manresa Farm Egg is a dish I have been itching to try making since I first saw the recipe on the Mind of a Chef. In this case I used the recipe from the Manresa book which uses a sherry cream instead of the lime cream as it was easier to make. The hard part was actually topping the eggs and cleaning the shells. After trying several eggs with a knife I finally gave in and bought a topper from Amazon which worked surprisingly well. I also broke several shells while trying to remove the membrane before learning that the best way is to boil the empty shells as it cooks the proteins and makes them easier to pull out. You can then wash the cleaned shells in a weak bleach solution for storage. You then put just the yolk back into the cleaned shell and add some chives and fleur de sel for flavour. The actual cooking is really fast and takes ~75 sec in an 85C sous vide bath. Once out of the bath, top the yolk with sherry cream and maple syrup before serving. 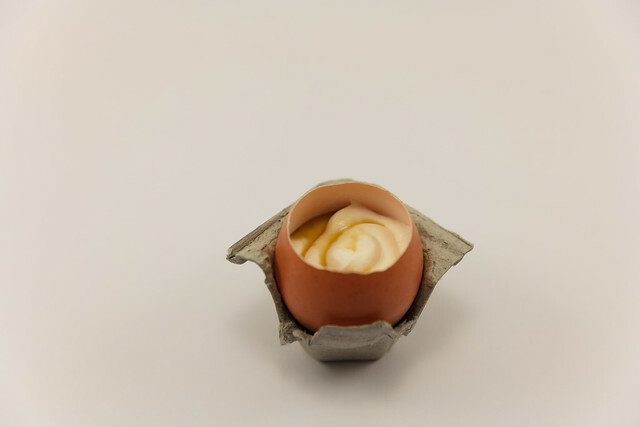 The tip for diners is to dig the spoon all the way to the bottom so you get the yolk and the cream which leads to a wonderful mix of warm/cold and salty/sweet flavours at the same time. It has quite an impact and is probably something I will do again. This is also something I will definitely ask for the next time we go to Manresa. This was one of the most satisfying dishes of the meal for me both from a taste and execution perspective. The dish was inspired by the slow poached egg yolk in allium broth at Commis. After having the dish I wanted to make it at home but felt it was just too complicated for me to make at home. 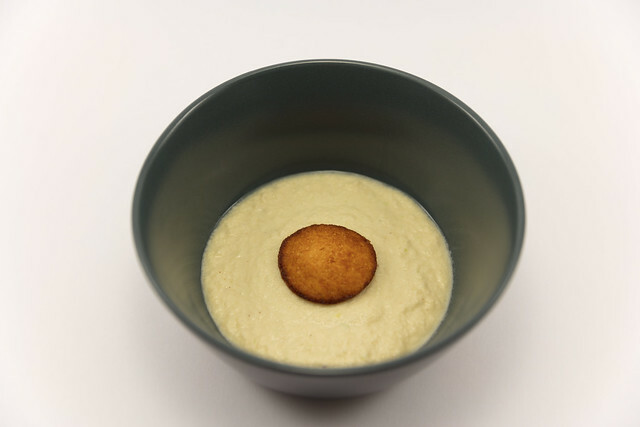 A little while after that we went to Taj Campton Place and when I had the fried idli a light bulb went off in my head and I realised we could replicate the sunny side up egg look by using a simple fried idli in the middle of a coconut chutney. 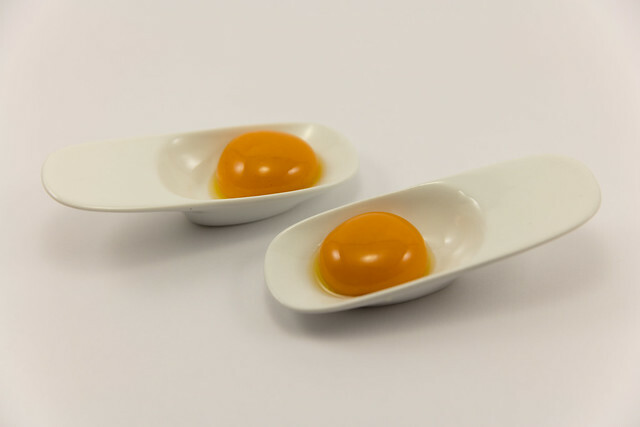 This is an old dish that I have made before and it is basically mango puree with a little smoked paprika that has been made into a “yolk” using frozen reverse spherification. I couldnt do an egg dinner without having some sort of pasta and so I decided to make some gnudi using the chefsteps recipe. Since the gnudi could be frozen, I made a big batch and tried it out beforehand which was a good thing as the flavours felt a little bland. For the dinner we ended up using a lot more sage and added some porchini powder and truffle salt to up the earthy flavours. 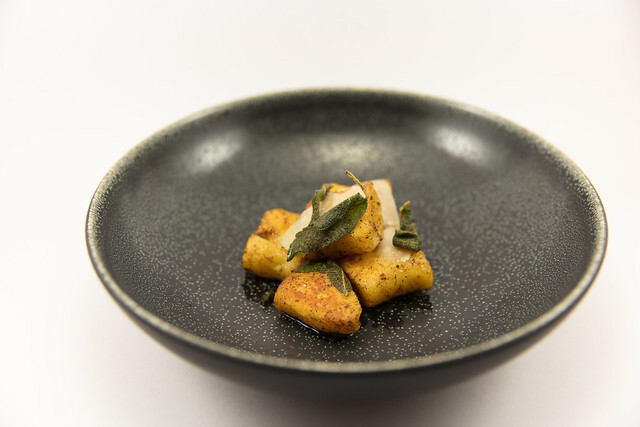 The texture was still a little grainy for my taste but the diners liked and I haven’t actually had gnudi before to know what it should be like. 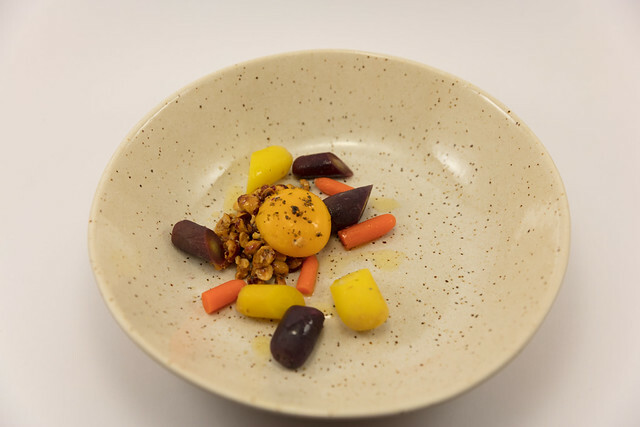 Fudgy Yolk with Hazelnut Crumble, Lemon and Carrots is another ChefSteps recipe but I made some changes and took some shortcuts. For making the yolks instead of dealing with an oil bath I just cooked the whole egg at 64C for an hour and then removed the whites by holding the egg under a stream of water. This causes the yolk and white to separate and you just retain the yolk. Be careful while removing the final remnants of the white as them may break the yolk. For the hazelnut crumble I used lemon juice and oil to add a little brightness. The failure in the dish for me was that the carrots merely looked pretty and did not really add any special flavour to the dish. The yolk and crumble was a nice mixture with the lemon acid but it felt like the carrots were just hanging around for no reason. 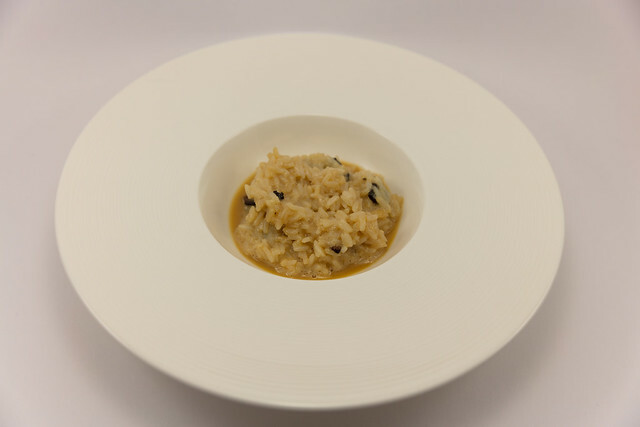 My “Risotto Carbonara” was one of the more interesting dishes as it merged a few different concepts/recipes to made a unique dish. I am a huge fan of pasta carbonara but have always struggled to cook it well at home especially if it has to be done in batches. As part of my research for this dinner I made a test batch of the Serious Eats recipe for Tamago Gake Kohan (raw egg in hot rice with soy and norifuke) and realised that the texture reminded me of risotto and the cooking method was very similar to carbonara. For the dinner I took the TGK all the way into italian flavours by taking hot rice and adding raw egg, parmesan, a dash of milk, soy sauce and pre cooked bacon before mixing them up to make the final dish. It ended up a little watery for my taste but I have to say it was a simple dish to make and much easier to make than either a risotto or a real carbonara. Next time I’ll use a mesh spoon to strain out the liquid before serving. I might add some more bacon on top to make it look better while plating. Chicken or the Egg came from my desire to make a a dish that had both chicken and egg in it. 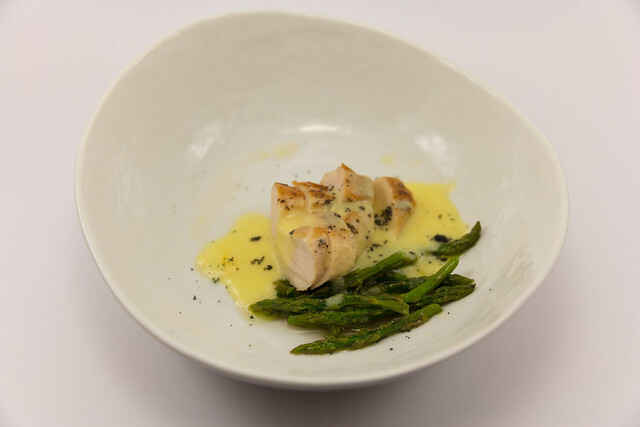 A little googling revealed that chicken with hollandaise and asparagus was a classic flavour combo and since I have made all of those things individually before I decided to go with the recipe. I sous vide cooked the chicken (65C, 1 hour) and the asparagus (88C, 4 minutes) earlier in the day and held them at 60C for service. I was planning to make hollandaise from scratch but in the end did not want to deal with another 4 yolks and whites so I used the Knorr hollandaise mix instead. Nithya pan seared the chicken before plating and it was very simply served on the plate over asparagus and drizzled with hollandaise and a little lava salt. This dish got a lot of complements and since it is so easy to make I foresee that it will become one of my go to chicken dishes. The Knorr mix is surprisingly good and a perfectly acceptable substitute for making hollandaise from scratch. 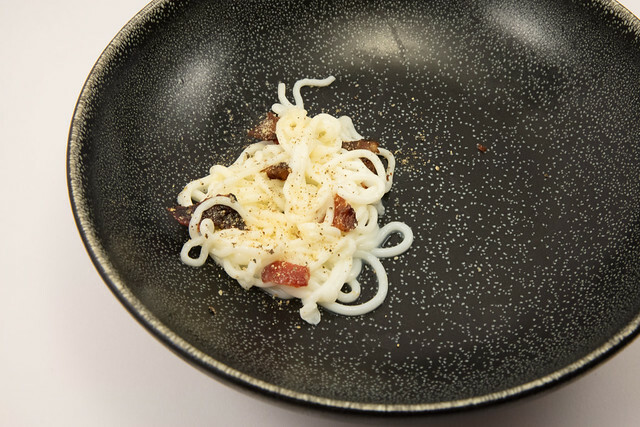 My Spaghetti Carbonara dessert is made with white chocolate spaghetti and candied bacon and is something I have written about before. The one change I made was to continuously extrude the spaghetti using a 4 foot hose immersed in ice water to set the agar as I slowly emptied the syringe. It was a lot faster than my original attempt using 3 sections of foot long hose. I served this dish with some Pennsylvania Dutch Egg Nog to continue with egg theme. This was my first time having egg nog and I have to say that I really enjoyed it. 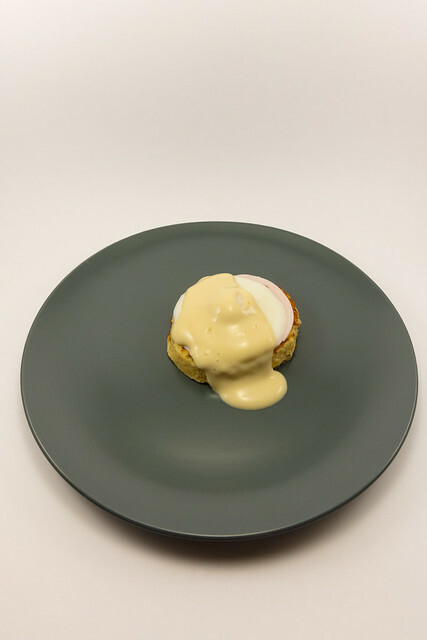 This faux eggs benedict was the most complex dish of the meal and required a bunch of prep work to create the various components beforehand. It consists of a coconut french toast “muffin”, strawberry yogurt “ham”, vanilla yogurt “egg white”, reverse spherified mango puree “yolk” and sweet vanilla bechamel “hollandaise”. The egg was spectacularly beautiful and I almost did not want to cover the yolk to make the final poached egg. The final plating before the bechamel was quite realistic as well. I followed most of the original recipe from the molecular gastronomy network with the minor changes of using coconut bread for the french toast and adding some brown sugar and blending the bechamel to get a sweeter sauce with a better texture. The one other tip is to not use Fage strawberry yougurt as it does not have sufficient flavour or colour. I made another batch with Yoplait strawberry and it came out perfectly. Also you can pour the strawberry mix into egg poaching rings on a plate to precisely shape the ham slices to fit the eggs benedict. 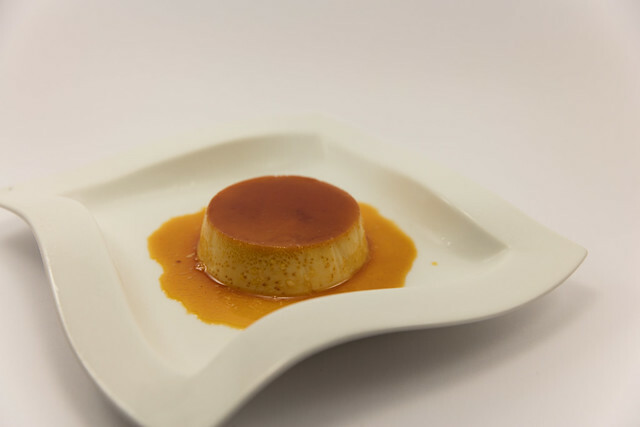 The final course was Nithyas classic flan which she has perfected over the years. All in all it was a great meal if a little on the long side. There were no notable failures and the theme did come through quite well. Next time I will stick to ~10 courses and maybe cut down one of the mains so that it doesnt become too much food. How long between each course? Very impressive regardless. Thanks. Time between courses varied since I was both cooking and eating. The more on the spot cooking needed meant the course would take longer to serve. But pre-prepared stuff like the eggs benedict only took 5 min to put together.